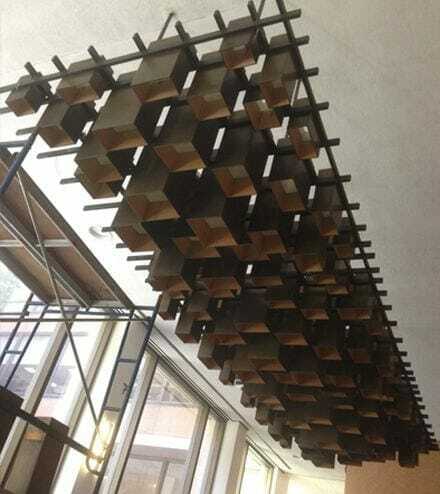 Brass cubes suspended from a stylized steel grid create a play of shadows in this midcentury modern monumental light fixture. In 1968, Thomas Jefferson University, one of the country’s leading healthcare learning institutions, opened the doors of Jefferson Hall. 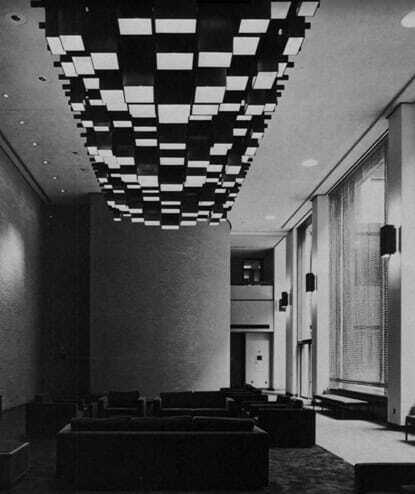 This abstract sculptural piece spanned the ceiling of the main lounge area. The building, designed by Vincent Kling & Associates, mirrored the school’s forward-thinking philosophy. Kling headed one of the largest architectural firms in Philadelphia and his touch can be seen throughout much of the downtown area.